Ginger is consumed all over the world as a delicacy, medicine or spice. It is a rhizome (a horizontal stem part of a plant that grows underground) of the plant family Zingiber officinal.Other members of this plant family are turmeric, cardamons (delicious in Indian cuisine) and galangal (used a lot in Thai dishes). Galagalis vey similar in appearance to ginger, but tends to have a milder flavour. Ginger cultivation began centuries ago in South Asia has since spread to East Africa and the Caribbean. Fresh ginger is found in ethnic grocers and increasingly in supermarkets. It can be kept in an airtight container for up to a month, otherwise buy the pickled or dried herbs, widely available at supermarkets. This tasty and widespread root often gets overlooked in the rush to buy over-the-counter remedies and other buffers against many seasonal ailments. However, throughout the centuries, ginger has been recognised for its healing properties. Among many other afflictions, it is beneficial in the treatment of colic, spasms and cold symptoms. Ginger ointment provides relief from headaches. Eating it in moderate quantities can stave off cold symptoms and anxiety. Try slicing two inches of fresh ginger and steeping in hot water for five minutes. Sweeten with honey for a refreshing drink, which will also boost your immune system. Ladies, did you know ginger could also help with PMS? It is also a reputed aphrodisiac! Orientals use ginger heavily throughout their culinary repertoire. In the West, ginger has found its way into ice cream and confectionery. It is used in jam and cakes, with Jamaica Ginger Cake perhaps being the best known cake to feature this herb. The beauty of ginger based drinks is that they double up as mixers and bases for many cocktails. They can also be added to soups and sauces. 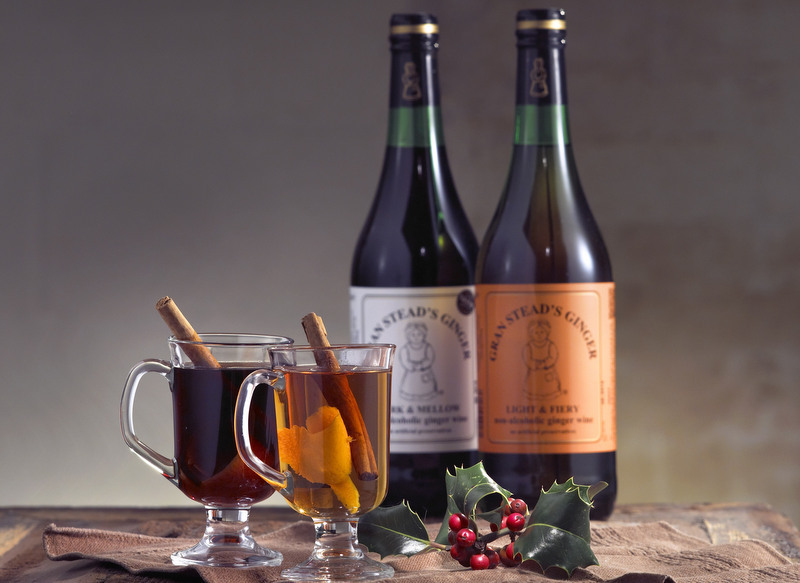 This Christmas why not try Stones Ginger wine – a delicious drink distilled from raisins and pure ground ginger. There are two varieties, the original 13% ABV or, the fortified 18% abv version for those of you who like more kick to your drinks. Each variety delivers what it promises, a full-on burst of ginger, but which doesn’t leave you overwhelmed. Stones’ wines retail at around £5.00 per bottle from supermarkets and off licences. See www.stonesgingerwine.co.uk for more information. Non-drinkers among you can look at a more recent arrival on the market. Gran Stead’s non-alcoholic ginger wines hail from Gran Stead’s 19th century recipe. Today the Knox family continue fermenting the tradition at their production farm in Sussex. Like Stones, they have a hot and mild equivalent, namely the ‘Light and Fiery’ (it is fiery, believe me!) and the ‘Dark and Mellow’ varieties. The wines are made from natural ingredients, including capsicum! Once opened the wines have a three month shelf life. Just perfect for drinking over the winter period. RRP £4.25. See www.gransteadginger.co.uk to order online or find a stockist near you. Simply Woman were delighted to sample chocolates made by Prestat who are chocolatiers to HRH The Queen Elizabeth II no less! Prestat presented a well packaged box of ‘Ginger Hunks’, a delectable box of 50% crystallised ginger pieces double coated in 70% dark chocolate. These choccies are sumptuous to the bite and fiery! So be warned! Box materials are recycled and all ingredients are produced from ethical farming methods. Prestat ginger Hunks retails at around £12.50 from stockists. See www.prestat.co.uk for more details.